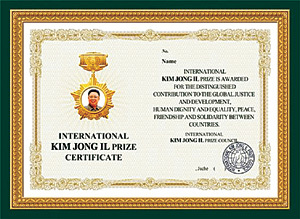 North Korea has revealed that it would set up an international award to honor its late leader Kim Jong-il. The award will be given to politicians, scholars and public leaders who have made a significant contribution in their country's struggle for independence. The awards ceremony will be held on February 16th, marking the Kim Jong-il's birthday. The date is a public holiday in North Korea, known as the Day of the Shining Star. Kim Jong-il led the communist nation since the death of his father in 1994, and inherited the leadership of the country from him. Shortly after he came to power, a severe famine caused by faulty economic reforms and poor harvests left an estimated two million people dead. His regime was harshly criticized for violations of human rights and was internationally isolated because if its pursuit of nuclear weapons. I'm guessing that this is all because they are looking for a breakthrough for the international sanctions caused by their violations by launching missile tests.